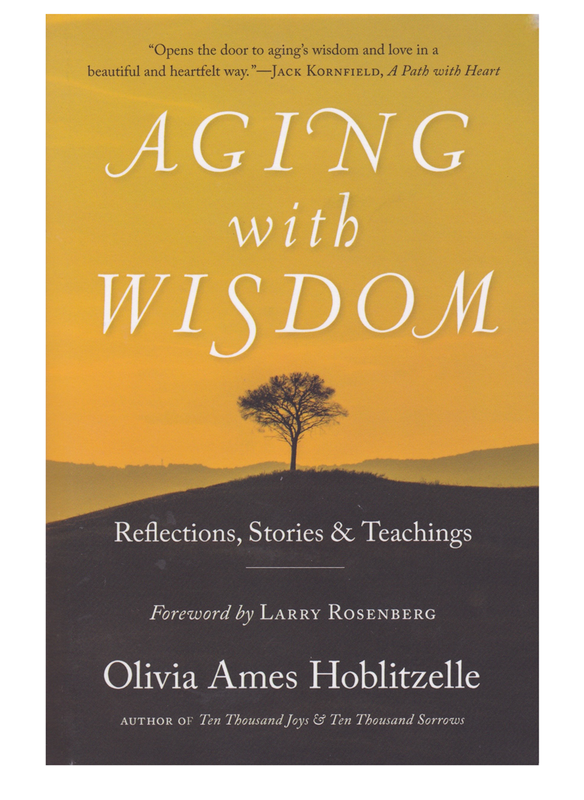 Since Aging with Wisdom covers many subjects that invite further discussion, the following Reading Group Guide can serve as a framework for book groups. I have included a number and range of questions, so that participants can choose the most compelling ones for discussion. When you hear the phrase “conscious aging,” what does it evoke for you? What would it mean to wake up to your life in new ways, to approach situations more consciously? Can you give examples of ageism you’ve experienced and discuss their impact? They can be very subtle. For example, a pejorative comment, condescending language, hostile jokes about aging, excluded from conversation, etc. What is your orientation toward the inner life? Do you have a spiritual practice of any kind, and if not, discuss how and where you find meaning in your life. We need to acknowledge that some people may not be comfortable with the word “spiritual.” The central question is how you inspire yourself when faced with life’s biggest challenges. Some people, for example, have a philosophy of life that includes cultivating positive qualities like compassion, kindness, generosity, equanimity, joy, love, and so on. As you’ve grown older, whether or not you’ve experienced a “tectonic shift,” can you describe the ways in which you’ve recognized you're growing older, and what, if any, changes you’ve made in your life—or would like to make. Carl Jung and other wise ones have called old age the most valuable period in life. Discuss how you feel about this statement, and whether it applies or not to your experience so far. What are the gifts of aging? In contrast, what are the challenges, disappointments, and harsh realities of aging? As we seek to balance the different elements of the aging process, what does the phrase “the grace of diminishment” mean to you? How do you relate to Teilhard de Chardin’s statement about hallowing one’s passivities and diminishments? Have you recognized your particular responses to the challenges of aging? Examples: resistance, denial, control mode, anger, fear, grief, etc. Almost inevitably, issues of independence and/or growing dependence arise in the later years. Some people find it really difficult to accept help, even reject help as a sign of weakness. What are your feelings about this subject? Whether or not you relate to the idea of a “forest monk” stage of life, has there been any shift toward deepening your inner life, toward reflection or contemplation of some kind? Have you noticed any impulse to simplify or downsize or change some of the outer circumstances of your life? Consider the challenging words of Rashani’s poem—brokenness, shatteredness, sorrow, fragility, darkness—and how you relate to these. “The sacred circle that shelters your life.” Consider together what this might mean to you and share these reflections with the group. The idea of taking refuge is common to many spiritual traditions. What are your refuges? What if you tried “to treat every moment as new experience?” What areas of your life might change? Have you ever considered what it would be like to lose your sight, how much we take our senses for granted? In what ways do you connect with others through some practice of the heart, whether blessing, prayer, wishing them well, or simply calling them into presence with love? Who are you now? Has your sense of self shifted as you’ve aged, perhaps as you’ve moved away from a nine to five job, parenting responsibilities, and so on. Loss is a major issue for all of us as we age. (Physical problems, memory loss, diminished sight/hearing, loss of dear ones, etc.) What are your thoughts/feelings about the issue of loss. How does your inner life help? We receive many memorable messages during our lives. What two or three have had a powerful impact over your life? The story of Dhumavati challenges many of our assumptions, such as a goddess archetype that describes many cruel aspects of old age. How do you feel about this story? The subject of death presents us with the ultimate koan—a paradox or riddle, unanswerable by the rational mind. What have been your experiences with death and dying, and what feelings arise for you as the group turns to this discussion? In the various excerpts about death (Rilke, Tagore, Thoreau, Nouwen, Master Sheng Yen), what do you find thought provoking, inspiring, or challenging? Mysterious occurrences may occur around or after death. Have you experienced or heard any stories that speak to this mystery? The Five Remembrances, or similar calls to remember the subject of death, are considered important practices in several spiritual traditions. How do these sayings strike you? We are seeing an epidemic of dementia-related diseases like Alzheimer’s. Have you been close to someone with dementia and if so, what has that brought up for you? If one accepts that there is consciousness beyond the mind, how might this affect how one relates to someone with dementia, particularly in the later stages? What are your feelings when you hear someone say that death is a gift? As you reflect on this term “wayshower,” who have been wayshowers for you? What inspires you about them? Each of the six wayshowers in this section reveals something unique about their elder years. Can you name some of those unique qualities? Is there one wayshower with whom you particularly identify? In the Conclusion, return to the list of the book’s important guidelines and see which ones are most compelling for you. Some may provide a springboard for further discussion. What is the most valuable message that you’ve taken from your reading of Aging with Wisdom?